In 1901, forward-thinking citizens on Mount Desert Island formed the Hancock County Trustees of Public Reservations (Trustees) to acquire lands for free public use. Empowered by the Maine Legislature in 1903 to own lands of “scenic beauty, historical significance, scientific study or sanitary value,” the Trustees acquired nearly 5,000 acres. In 1916, they donated their holdings to the United States, forming the core of what became Acadia National Park. 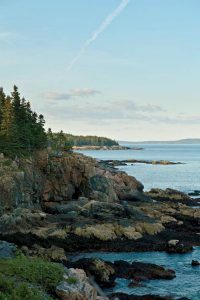 The Trustees legacy, however, extends beyond the confines of Acadia National Park. The Trustees have owned and made the Woodlawn estate, home of the famous Black House, available for public use and enjoyment since 1929. 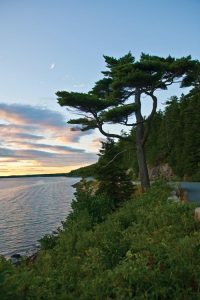 For the next several decades after the formation of Acadia National Park, the Trustees focus became more and more narrowed on their role as stewards of Woodlawn. In time, they developed Woodlawn into a widely prized and beloved cultural institution, with their efforts ongoing today. Yet their support of Acadia National Park did not cease with their 1916 gift. In 1929 they donated a large tract of land in Winter Harbor, creating the Schoodic Peninsula portion of the park. In 1959, they donated 279 acres in Southwest Harbor and 250 acres in Tremont. Several smaller parcels were donated in the 1960s. In 1986, the Trustees donated an additional 110 acres in Winter Harbor. In celebration of the Park’s Centennial, the Trustees transferred their last remaining property within the boundary of the Park, 2 acres near Seawall in Southwest Harbor, in 2016. Through their projects to create Acadia National Park and develop Woodlawn as an enduring cultural institution, the Trustees have created a lasting legacy by building a sense of place and community pride enjoyed by millions each year. 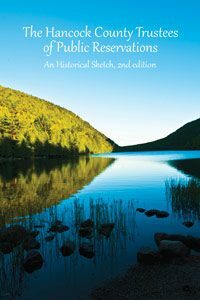 The Hancock County Trustees of Public Reservations: An Historical Sketch, 2nd Edition is an updated version of an original pamphlet published in 1939 titled, The Hancock County Trustees of Public Reservations: An Historical Sketch and a Record of the Holdings of the Trustees. The 2nd Edition provides an updated history written by Ronald Harry Epp, Ph.D and an overview of the Trustees role at Woodlawn by Joshua C. Torrance, Executive Director. An updated map/record of the holdings the Trustees lands transferred to the Federal government is included. The book is enhanced with photographs taken by Walter Smalling, Jr. a professional photographer who specializes in historic architecture and has studios in Washington, D.C. and Penobscot, Maine.